Misfiring Chelsea again missed the chance to go top of the Premier League table as they had captain John Terry sent off at Goodison Park. 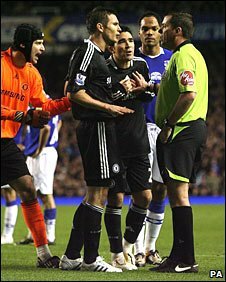 In the 35th minute of a physical encounter which lacked quality, Terry was given a straight red card for a reckless studs-up lunge at Leon Osman. Chances were scarce as Steven Pienaar bundled in from a yard for Everton late on but was ruled to be offside. The Blues drop their first away points of the season as Liverpool remain top. Both sides lacked cutting edge with the hosts, without a recognised striker in their 18-man squad, having to rely on midfielder Tim Cahill to lead the line. Chelsea, with Nicolas Anelka quiet and Joe Cole still struggling for form, failed to maintain their 100% away record and missed out on setting a new mark for consecutive away victories in the top flight. But considering they played over half the game with 10 men, they may be happy with a point. Despite the shadow cast by Terry's red card, the match was characterised by commitment and hard work from both sets of players - but, also, an acute lack of quality. Chelsea were first to show when, after Everton right-back Tony Hibbert was caught napping in the fourth minute, Ashley Cole's vicious high volley forced Tim Howard to dive high and push round his post. The hosts, full of graft and bite, hit back immediately when Phil Neville lashed a low drive into Blues keeper Petr Cech's arms before Cahill and Marouane Fellaini had headed attempts on goal. Anelka nearly forced the ball awkwardly into the net after 19 minutes but was flagged offside. Chelsea were slick and patient in their build-up play but the final touch around the box was lacking. Perhaps it was that frustration that caused skipper Terry to lunge at Osman. The ball had spilled loose but as both players went for the challenge, Terry's studs appeared up and he was too high and a little late, leaving Osman prone on the ground. Referee Phil Dowd consulted his linesman long and hard before dismissing the England defender. Chelsea's anger boiled over minutes later when Frank Lampard and Ashley Cole were both booked for dissent after which Joseph Yobo went close for Everton as he hooked his foot around a low right-foot volley to force Cech into a smart low save. Striker Didier Drogba replaced Anelka and defender Branislav Ivanovic came on for Joe Cole as the second-half got under way with Chelsea manager Luiz Felipe Scolari seeking to find a new solution with one man missing. Yet Everton looked the more likely to take a lead as Hibbert, a constant source of effective crosses from the right wing all evening, whipped in a pacy cross for Fellaini. The Belgian international made a superb connection with his head but the ball sped straight into the relieved Cech's arms. After more than 20 minutes of hustle and bustle, Joleon Lescott got on the end of a Hibbert corner to force Cech to palm the ball away from his top corner in the 75th minute. Everton had not been making best use of the extra space available to them but that changed in the final 10 minutes when substitute Leighton Baines sent in a low cross for Fellaini to backheel inches wide. Pienaar then forced the ball out of Cech's hands and into the net with minutes remaining - but the Everton midfielder was flagged offside. Everton: Howard, Hibbert, Yobo (Baines 61), Jagielka, Lescott, Neville, Osman, Arteta, Fellaini, Pienaar, Cahill. Subs Not Used: Nash, Van der Meyde, Rodwell, Jutkiewicz, Gosling, Kissock. Chelsea: Cech, Bosingwa, Alex, Terry, Ashley Cole, Mikel, Joe Cole (Ivanovic 46), Ballack, Lampard, Deco (Bridge 87), Anelka (Drogba 46). Subs Not Used: Cudicini, Malouda, Kalou, Belletti. Booked: Ashley Cole, Lampard, Ballack.